You only need to pre-register ONE time to play in one or both of these events. 1. Need an account? Click here: Ultimate Bet and download the host/poker site. 2. Go to Online Forum Challenge to pre-register (required) for the event. 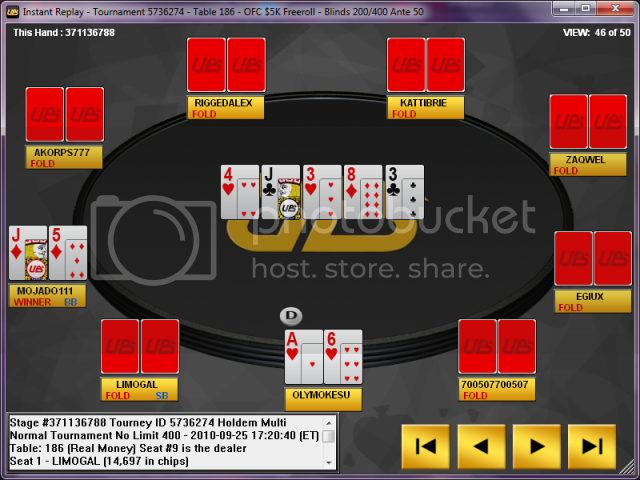 Choose PokerFreerollsOnline from the drop down menu. 3. Once registration opens 24 hours before the event, go to Utimate Bet and register. You will be representing: "PokerFreerollsOnline"
I guess new GGE notice isn't set to plug your player name into the email now. Thank You. 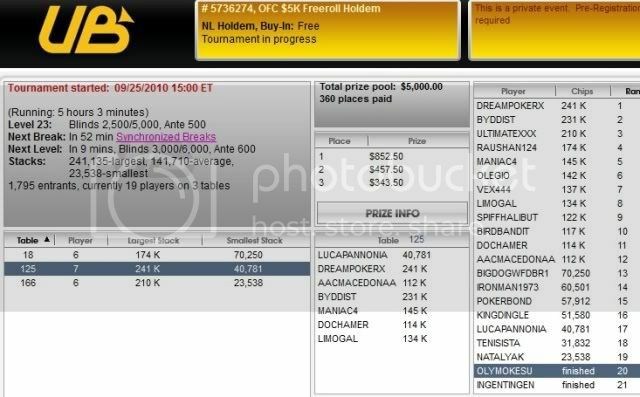 I chose PokerFreerollsOnline the list we see the final table. Good luck. Good Luck All hope to see you at the final table. "The Cream Always Rises To The Top"
Hello Folks, it's second break and still hanging tuff, hope to cash in this one. Good Luck to all that are still in it. See ya in the game. While I love cereus blind structure, the amount of time they give these morons to play is way too long. Tic Toc Tic Toc started with 36 left to go til ITM and never stopped even after the bubble. Apparently, these freeroll whores don't realize that running out the time every play may get them itm or even a few dollars deeper, but isn't going to get them to the final table where the decent $ are. One of the worst offenders wasn't even ss and had enough of a roll to really play for decent money. I just don't get it. Thanks Term ...Try N to Last a little long and needed that! I think I jinks myself cause I'm out in 336th dang nabbit, oh well it happens. WTG to whos still in it. At least you're still in!!! Gratz to oly for a great finish. QQ vs AA - just bad luck. Congrats Oly well played trny. Tomorrow is the one that counts so Best of luck all, hope to see you at the final table. Knock on wood, lol. And Larr, " Tomorrow is the one that counts " ? I doubt the buy-in has the prizepool that the freeroll had. I wish it was later like 9:30pm, then I could have fallen asleep playing it. GameDay and tailgating wins everytime for me! I'm not sure why you would think one counts over the other? Actually I forgot the FR had 5k prizepool. The way I see it is you get much better play in buyins and the field is much lower for better chance to make the money\win.